Welcome to the Other Voices home page. Welcome to the Other Voices magazine/OV Books home page! Other Voices would like to thank you for your interest and support, whether this is your first visit or whether you've been subscribing for years. As of the end of 2007, we are officially transitioning to a book press only company, and Other Voices magazine will no longer be published. We are therefore no longer accepting submissions. 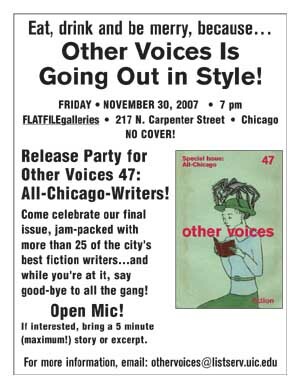 Our final issue, celebrating Chicago writers, is available as of late November 2007. OV Books will continue to publish collections and anthologies of short fiction, as an imprint of Dzanc Books. We are not currently accepting submissions but will be in the future. Please check back for more information! Other Voices, Inc. is a non-profit literary press encompassing the longstanding literary magazine, Other Voices, and its brand spanking new fiction imprint, OV Books. Other Voices, a fiction-focused magazine established in 1984, is dedicated to publishing diverse, original short stories by authors ranging from literary bestsellers to cutting-edge experimentalists. We also publish interviews with eminent fiction writers and reviews of contemporary fiction (primarily independent press titles.) Writers published in Other Voices’ illustrious history include Toni Morrison, Pam Houston, Dan Chaon, Richard Ford, Stuart Dybek, Antonya Nelson, Melissa Banks, Jane Smiley, Steve Almond, Josip Novakovich, Aimee Bender, Peter Ho Davies, Michael Cunningham, Terry McMillan, Junot Diaz and Aimee Liu—alongside a host of emerging and new writers introduced in each issue. Work from Other Voices was anthologized in the Best American Short Stories of the Century, edited by John Updike. Other Voices magazine has its finger on the pulse of contemporary literature across all boundaries of race, age, ethnicity, nation, physical ability, sexuality and religion. By publishing up to twenty stories per issue, we’re able to offer you more of what’s new and exciting than just about any other magazine. Other Voices doesn’t give our space to poetry, essays, cartoons or other visual arts (there are plenty of other forums for those worthy pursuits); our sole dedication is fiction. OV Books, our new fiction book imprint, has a similar mission: to keep the short story form vital in today’s competitive and increasingly-commercial marketplace, where short fiction has been largely marginalized by corporate conglomerate publishers. By publishing short story collections and anthologies, we aim to give writers and readers alike another option. In collaboration with the University of Illinois Press, OV Books’ first title, Simplify by Tod Goldberg, is in its second printing. OV Books is happy to announce that its second title O Street by Corrina Wycoff will be out soon. Just click on the OV Books icon to find out more about this vibrant new addition to the Chicago—and national—publishing scene! Despite our recent growth, Other Voices still considers itself a family: small, but always eager to set a new place at our table. Our operation is not run by famous “guest editors” or a changing rotation of university interns, but by dedicated readers and writers who began the magazine from scratch out of a modest home office in Highland Park, Illinois nearly twenty years ago. We owe all our successes to you—our readers. Whether you’ve come aboard for the first time or whether you’re an old friend checking in to see what’s new, we hope you’ll enjoy your stay. Tell your literature-loving circle about us—not to mention your favorite independent bookseller—and come back and see us again soon. And don’t forget to tell us what you think!